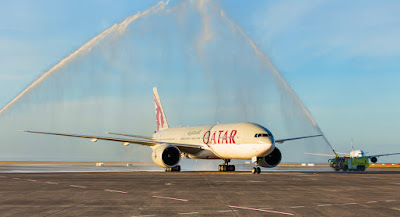 Qatar Airways has claimed the distinction of operating the world’s longest passenger flight by duration with the launch of daily service from its headquarters in Doha to Auckland, New Zealand. Doha-headquartered Qatar's new record-breaking service from Hamad International Airport (DOH) arrived at Auckland International Airport (AKL) on Feb. 6, one of the most significant days of the year for New Zealand. Feb. 6 is Waitangi Day, which commemorates the signing of New Zealand's founding document, the Treaty of Waitangi, in 1840. The arrival of the flight brought additional cause for celebration. Events marking the flight that covered a distance of 9,032 statute miles included a traditional water cannon salute as the Boeing (NYSE:BA) 777 taxied from the active runway after its arrival at AKL. “The launch of our new service to Auckland is an important milestone for Qatar Airways as we expand both in the region and globally across our network providing more options and better connections to ... business and leisure destinations in Europe and the Middle East," Akbar Al Baker, the airline's chief executive, said in a statement announcing the commencement of the service. Flights from AKL to DOH will be the longest by duration with a published flying time of 17 hours, 30 minutes. Flights from DOH to AKL, aided by the jetstream, are scheduled at 16 hours, 10 minutes. Qatar had planned to begin operating the route in July 2016 but delays in aircraft deliveries forced a seven-month postponement. Auckland is the first city in New Zealand to be served by Qatar Airways and will provide a gateway for travelers to visit the country, which is famous for its spectacular coastlines, lush forest landscapes and its wine industry. After visiting New Zealand in 2016, I published a guide to Making the Most of Auckland, which is available here, and a guide to Making the Most of Christchurch, which is available here. Qatar operates a Boeing 777-200LR on its new route. According to SeatGuru.com, Qatar’s 777-200LR is configured with 42 flat-bed Business Class seats, and 217 Economy seats that provide more space than many other carriers. Business Class seats are 22 inches wide with 78 inches of pitch while Economy seats are 18.9 inches wide – among the most generous Economy seats in the industry – with 33 inches of pitch. For comparison, the Emirates 777-200LR on which I flew from DXB to AKL had eight First Class enclosed suites with seats that were 23 inches wide with pitch of 86 inches. The 42 flat-bed Business Seats were 20.5 inches wide with 60 inches of pitch, while the 216 standard Economy seats were 17 inches wide with 33 or 34 inches of pitch. Qatar's daily Doha-Auckland-Doha service will enable the shipment of 116 tons of belly-hold cargo every week to support the growing imports of raw, industrial and consumer materials into New Zealand. The flights will also facilitate exports from New Zealand, including perishable products. At the state-of-the-art Hamad International Airport (DOH) cargo terminal at its home base in Doha, Qatar Airways Cargo operates a temperature-controlled handling and storage solution, enabling the carrier to deliver products including dairy produce, meat and fruits produced in New Zealand into the Middle East and on to major European cities. Passengers planning to travel to New Zealand can include a stopover in Doha as part of their journey. With a new transit visa program offering visitors a free transit visa for up to 96 hours, travelers can combine a quick visit to Doha with its historic sites, five-star shopping and resorts on their way to or from New Zealand. Qatar's DOH-AKL service wrests the record for the world's longest passenger flight by duration from Emirates, which had held the dual distinction of world’s longest passenger flights by distance and duration since March 1, 2016 when it began operating the ultra-long-haul 8,825 statute mile flight between Dubai International Airport (DXB) and AKL. Qatar’s flight edges Emirates out of first place for longest flight by duration by 15 minutes’ flying time. The record for the longest commercial flight by distance was claimed by Air India in late 2016 when it reversed direction of its flight from Indira Gandhi International Airport (DEL) in Delhi to San Francisco International (SFO) and began flying eastbound across the Pacific instead of westbound across the Atlantic. The change added 870 miles to the route for a total of 9,506 miles, but allowed the flight crew to take advantage of strong tailwinds that blow from west to east, chopping two hours off its overall travel time. Only a very few commercial aircraft have the range necessary to negotiate these ultra-long-haul routes. The longest range Airbus jetliner in service is a version of the A340-500, capable of flying up to 10,358 statute miles. A version of the A380 is capable of flying 9,445 miles while a version of the A350-900 can fly 9,320 miles. The longest range Boeing airliner in service is the 777-200LR, which can cover 9,842 miles, while the announced B777-8X will be capable of flying 10,010 miles. Neither distance nor duration record may stand for long. Singapore Airlines is reportedly preparing to reinstate its Singapore-New York (SIN-JFK) route that will cover 10,252 miles in 19 hours, making it the longest ultra-long-haul flight by both distance and duration. When that will happen, however, is uncertain. Singapore’s public relations office has not yet responded to TheTravelPro’s request for more details, and a check of the airline’s website for the SIN-JFK route for a flight in September 2017 returned only flight pairs that connected through a Western European gateway. While hopping on a short- or medium-haul flight is quite commonplace and requires only a modest amount of preparation for an experienced traveler, long-haul and ultra-long-haul flights are another matter. Prior to taking two back-to-back ultra-long-haul flights last spring, TheTravelPro published some tips on preparing for spending such a long time in the air. That article is available here. Amazing! It is amazing that there are people in the world like you, that take the time to write something like this and share it with everyone. I’m so glad to have stumbled across this. You can know some more information related to Qatar Airways Flight Status and book a flight at reasonable cost.